Let’s be honest. It’s easy to stop believing in yourself when you hit Rock Bottom. With each passing day you seem to lose yourself. Your circumstances hang over your head like a dark cloud that will never seem to pass. You may even start believing the lies that people have told you about who you are, what society says about you or most importantly what you’ve told yourself. I started believing that I was hopeless and couldn’t help myself. I was living in fear. I was living in lack. I had a poverty mindset and didn’t think I could survive financially. I forgot who I was. I forgot my truth. But what was my truth? By September of 2014, I was drained emotionally, spiritually and physically. I was fighting a nasty custody battle to get more time with my son. I couldn’t find a job despite my college degree and professional background. I had secured an apartment by this time, but was seriously facing being homeless again because I was running out of money to pay my rent. I slipped into serious victim mode and depression. I cut off communication from my boyfriend and best friend for weeks. I stayed cooped up in my apartment as the walls seemed to cave in on me. I felt so alone and hopeless because I didn’t see how I could change my circumstances. I cried morning, noon and night. 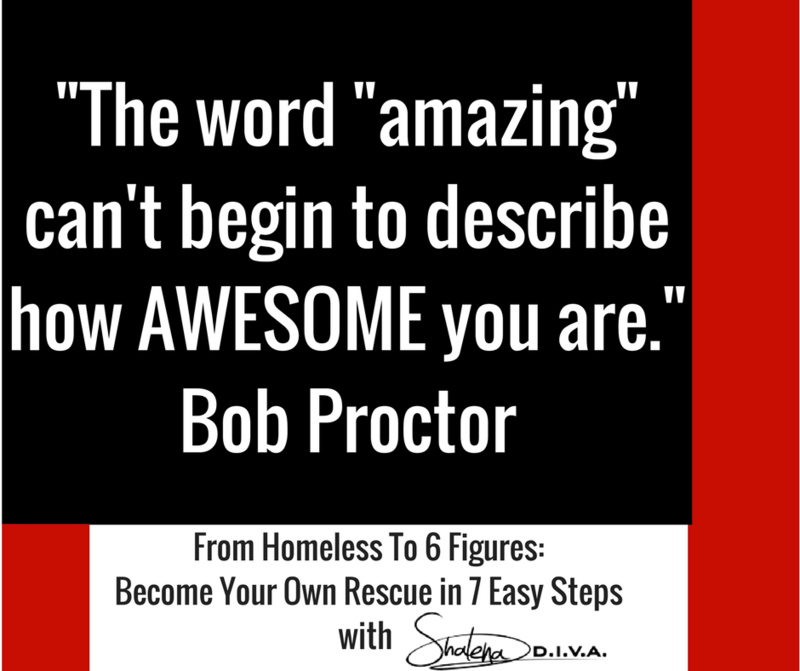 One afternoon, I surfed Youtube and found a video by a man named Bob Proctor. He caught my attention because he said I was born to be rich. He also said that the word “awesome” couldn’t begin to describe how amazing I really am. I was like… this man is crazy!!! He said that since childhood we are taught to not think too highly of ourselves and that we’re being conceited when we say things like we’re amazing. He told me that I could change my life by changing my thoughts. I meditated on the phrase “I am amazing.” It was hard to accept at first because I didn’t believe it. How could an amazing person end up in my situation? Even though I struggled with this affirmation, I kept at it. This one saying led me back to my truth. I believe in the Bible and started reading it again. It tells me that I am abundant, fearfully and wonderfully made, that I could do all things through Christ and that God did not give me a spirit of fear. Lastly, the Bible told me that God had given me the power to create wealth. I held onto these truths for dear life and started acting upon them, especially the fact that “God gave me the power to create wealth” (Deuteronomy 8:18). Within a month of changing my thoughts, believing my truth and acting upon it, I generated $30,000 in my business. Say what??? Yes, I did. Don’t worry, I will walk you through the details over the next few days. As you can see, I allowed my circumstances to shake my belief in myself. I started to believe things about myself like I wasn’t worthy or capable of creating a better life. These were ALL LIES. Have you started believing lies, too? It’s time for you to start TELLING THE TRUTH and taking control of your life. You are MORE THAN AMAZING. You can create the life you’ve always dreamed of. But it starts with your thoughts. Today I want you to own your truth. Write down positive statements abut yourself such as I am worthy of success. I am deserving of love. I can help myself. Affirm yourself by reciting these sayings in the mirror out loud several times a day. It may be difficult in the beginning, but it will get easier. I promise. By the end of this week you will have boosted your confidence in yourself and your abilities. You’ll need this confidence to do the things I suggest in the upcoming steps.